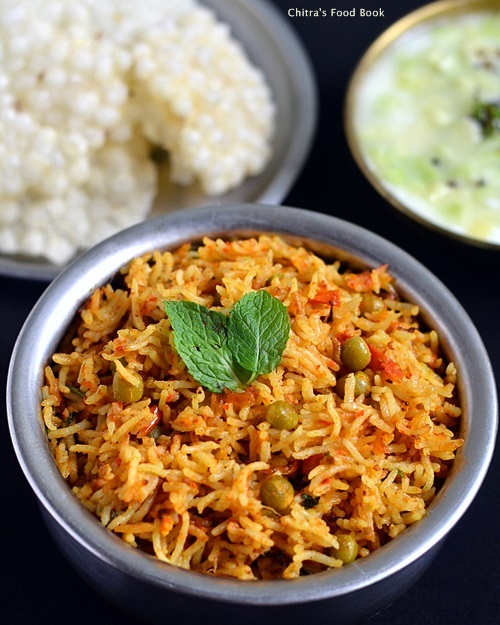 Wash and soak the basmati ride for 20 minutes and drain the wate completelyr.Heat 1 tsp of ghee in a kadai and roast the rice for 5 minutes.Remove and keep aside. Wash and chop the onions,tomatoes and set aside.Soak red chillies in hot water and grind it with other ingredients given under”to grind” to a smooth paste adding enough water. In a cooker base,heat oil and saute cinnamon,cloves,cardamom,kalpasi and biryani leaf.Now add the chopped onions & ground paste.Saute till raw smell goes off.Add tomatoes & saute till its mushy.Add the required salt to ease the sauting process. 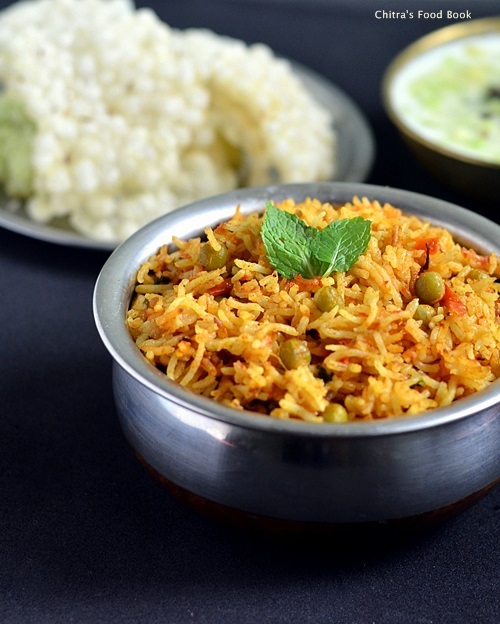 Lastly add the green peas,roasted rice,water,coconut milk along with finely chopped mint & coriander leaves.Mix well and pressure cook in low flame for one whistle.Open the cooker & fluff the rice. Serve it hot with raita.Enjoy ! For variations,u can use either coconut milk or water alone. If u don’t want to roast the rice,soak the rice for 1 hour and use 1.5-1.75 cups of water.Add ghee in the water before pressure cooking. You can also use tomato puree instead of chopped tomatoes.In that case,add 1/2 cup. 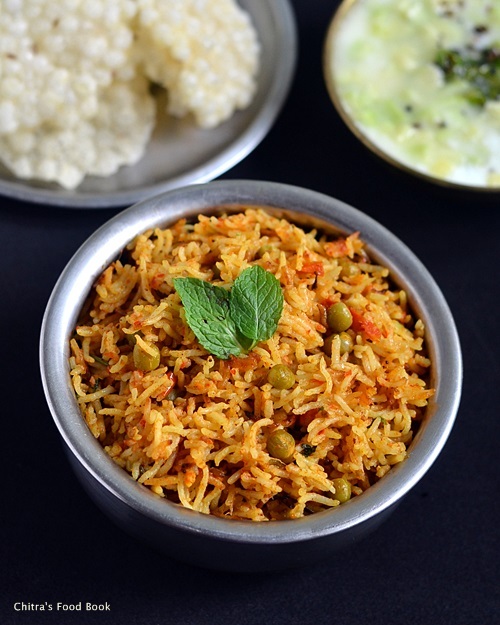 Check out my Tomato rice,Tomato pulao,Tomato rice using rice cooker . I served with Sago Vadagam and Cucumber Raita. 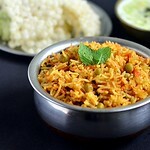 Very tempting n red colourful biryani. Sure.Did u mean Chickpeas/Kondakadalai or Chana dal/Kadalai paruppu ? No,both are different. 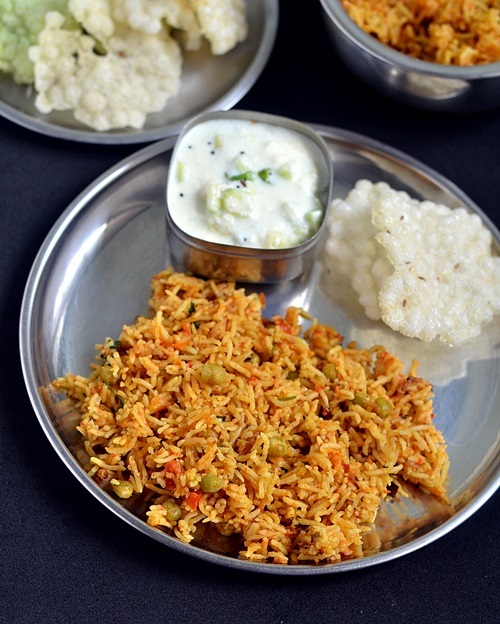 My Neighbour (from karaikudi)used to prepare non veg briyani and kuska using kuranai arising(broken rice especially for briyani and variety rice)... Any how thank you so much for responding.. I made tomato biryani today and we all loved it. My husband was all praises. Your sunday biryani series has now become Saturday series in my home for the past one month. Thanks for the flavorful collection. Thanks a lot for your sweet words. Glad to know you are trying my biryani recipes.